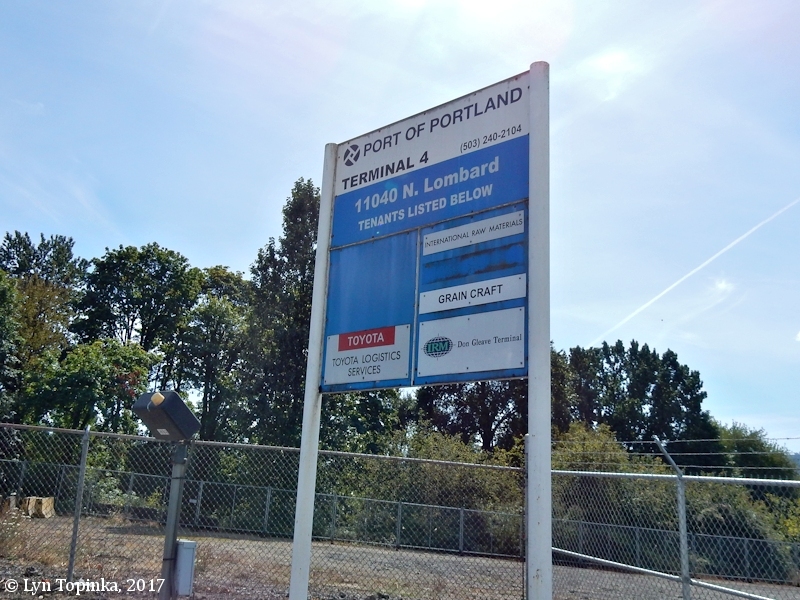 "Terminal 4, Willamette River, Oregon"
Click image to enlarge Sign to Terminal 4, St. Johns, Oregon. Image taken January 2, 2013. Portland's Terminal 4 is located on the Willamette River in St. Johns, Oregon at Willamette River Mile (RM) 5. Click image to enlarge Sign for Terminal 4, St. Johns, Oregon. Image taken September 13, 2017. On April 2, 1806, Captain Clark and seven men left their main camp at Cottonwood Beach (Washougal, Washington), entered the Willamette River behind today's Hayden Island, and explored 6 miles of the Willamette, passing the eastern end of the Multnomah Channel as they went. 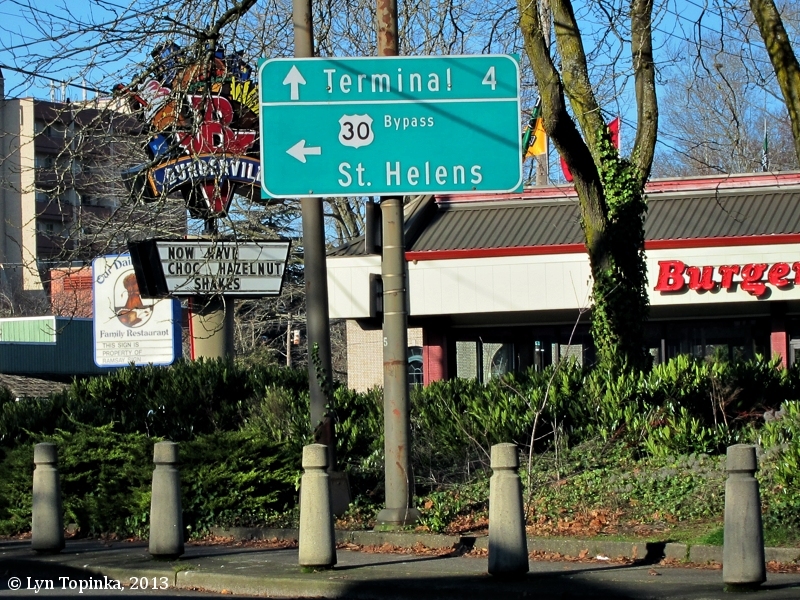 The men spent the night just downstream of today's Cathedral Park at St. Johns, upstream of the Port of Portland's Terminal 4, and across from Linnton, Oregon. The next morning Clark explored just a short distance upstream, reaching the location of today's St. Johns Bridge, before turning around and heading back to the main camp at Washougal. Today a statue and two plaques are located at the University of Portland commemorating Captain Clark's exploration. Another plaque is located at Kelley Point Park, the easternmost point where the Willamette meets the Columbia. 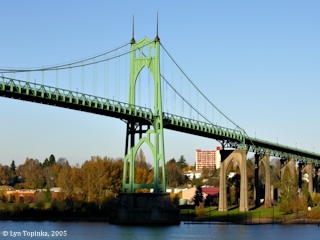 Click image to enlarge St. Johns Bridge and Cathedral Park, Oregon. Cathedral Park lies underneath the St. Johns Bridge. 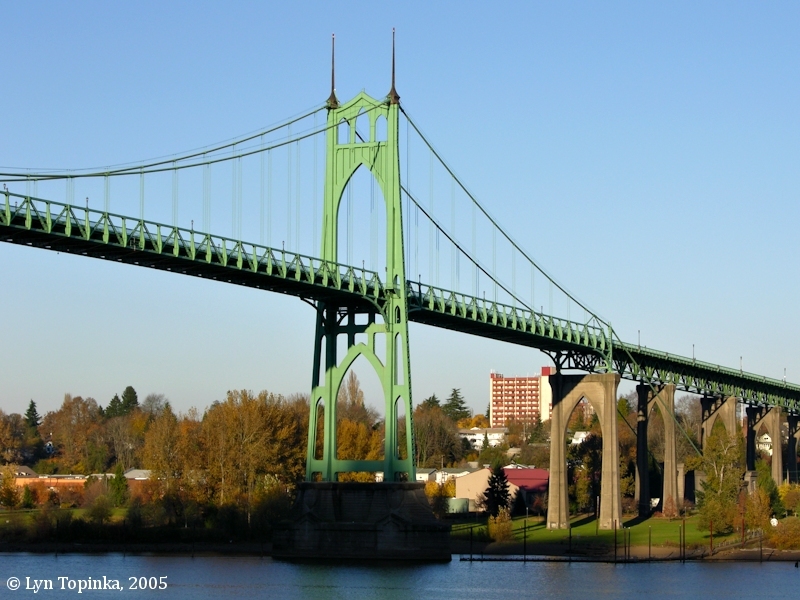 On April 3, 1806, Captain Clark explored the Willamette River upstream as far as the St. Johns Bridge. Image taken November 20, 2005. 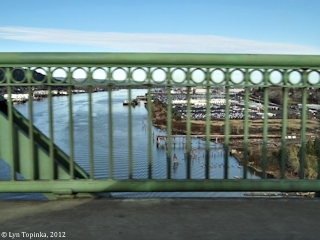 Click image to enlarge Portland's Terminal 4, as seen from the St. John's Bridge crossing the Willamette River. Image taken January 11, 2012. Member Chuck Sawhill didn't set out to do anything controversial. He was only looking for more information on Clark's adventure up the Willamette River. Next thing he knew, OLCTHF President, Keith Hay, had "suggested" that Chuck lead a project to search and clarify the extent of Clark's exploratory excursion up the Willamette including the location of Clark's camp and turnaround point, as well as compile an inventory of existing and potential statues and plaques. Being a Lewis & Clark novice, Chuck asked for an experienced L&C person and got Glen Kirkpatrick. In addition, they received valuable advice and expertise from Keith Hay, Roger Wendlick, and Doug Erickson. Lewis and Clark missed the Willamette River on both the west and east bound portions of their travels. Contrary to popular belief, the mouth of the Willamette River was not obscured behind Image Canoe Island (Hayden Island). Our findings, based on a comparison of Clark's maps to the 1888 nautical charts, reveal that the Corps simply mistook the mouth of the Willamette for water flowing around the numerous islands in the confluence of the rivers. This would be easy to do from the north edge of the Columbia River due to the flat terrain and wide gentle current of the Columbia. Also, the Captains had a pre-conceived notion that the Quicksand (Sandy) River was the main drainage to the south due to its massive multiple channel deltas into the Columbia. Therefore, they were not looking for a major river when they passed the mouth of the Willamette. Clark's map shows five distinct islands at the mouth of the Willamette. These can all be identified by their shape and location on the 1888 map of the river. Upon close inspection it is evident that the lower point of the third Image Canoe Island, today's Kelly Point, is where Clark starts his course and bearings. Clark measures from Kelly Point to the Multnomah channel, a dead reckoning distance of 5 miles. 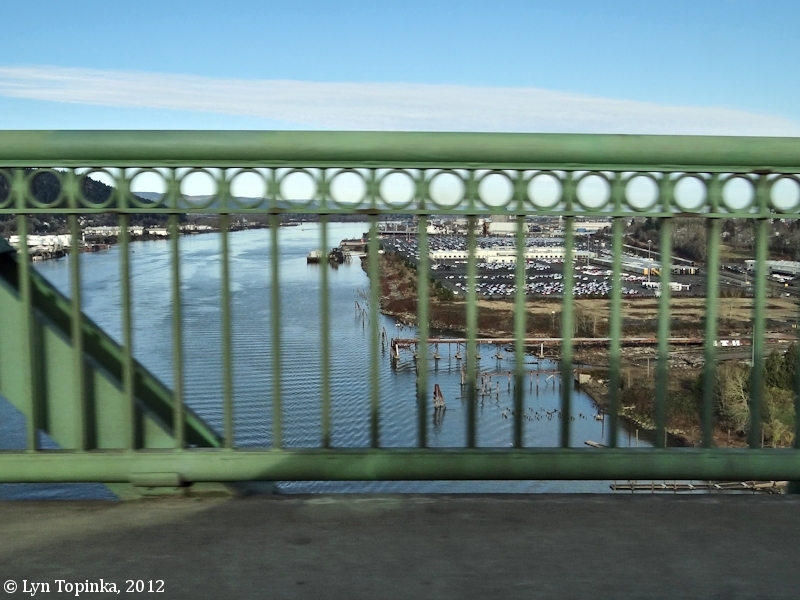 The actual distance from the mouth of the Willamette to the Multnomah Channel (then and now) is only 3.2 miles so Clark must have incorrectly estimated the distance. However, plotting Clark's 1806 bearings on the 1888 map confirms the accuracy of the bearings. Clark took a bearing of S 60 E from the Multnomah Channel to the Indian house on the Lard (east) side of the river where he camped on the night of April 2. He also notes high pine lands above the house and high bold lands on the starboard (right) side. He estimates the distance from the Multnomah Channel to the camp at three miles. He notes that some smaller houses are situated on two bayous, which appear on the S. E. side a little below the house. From the Indian House, Clark takes his final bearing of S 30 E to the spot where he turned around. Clark described the spot where he turned around as a "bend under the high lands on the Stard Side passing a larborad point." He goes on to say "thence the river bends to the East of S East as far as I could see," noting on April 3rd that "the mist was So thick that I could See but a Short distance up this river." At the turnaround point, Clark found "the wedth of the river ... 500 yards and Sufficiently deep for a ... Ship of any burthen." Clark's bearings from the camp to his turnaround point were plotted on the 1888 map. They lead directly to a bend under high lands (as Clark had described) near the present day St. Johns Bridge. 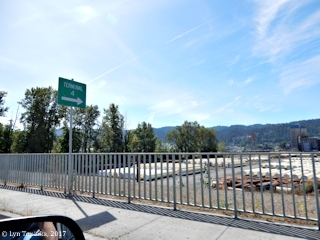 The bend in the river at St. Johns is the only bend that can be reached by two lines of sight going from the Multnomah Channel to the east bank and back to the west bank. Many of the earlier editions of the journal interpret the turnaround point from Clark's dead reckoning of ten miles from the mouth of the river, thus putting the turnaround at Waud's Point. The required conditions do not fit Wauds Point. The river is taking a sharp east-west "s" curve to the east of Swan Island. If he had proceeded to Waud's point, he should have noted Swan Island and Boggs Bottom and plotted them on his maps. He would also have noted them in his journal, which he didn't. This is strong evidence that Clark did not make it that far up the river. Clark estimated the distance from the Columbia to the Multnomah Channel to be five miles when it was only about three miles. If he did the same for the distance from the Multnomah Channel to the turnaround, the distance would not be five miles but three miles. Scaled on the 1888 map, the original bearings and revised distance together lead to the St. John's area as the turnaround point. Source: Oregon Chapter of the Lewis and Clark Trail Heritage Foundation, June 2000 Newsletter, vol.2, no.3.